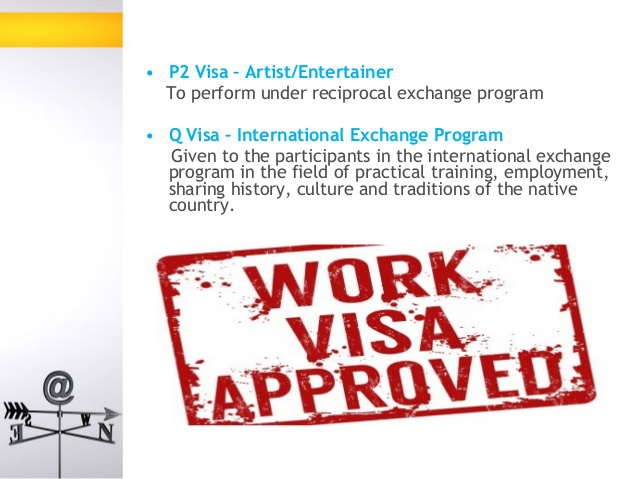 The P-2 classification of visa is for individual artists/entertainers or a group of artists/entertainers who want to perform their craft in the United States under a reciprocal exchange program. This program allows for artists and entertainers to enter the US to perform while at the same time allowing for similar types of artists and entertainers to perform abroad. The program is between a US based labor organization and an organization based in another country – this is the reciprocal nature of the relationship. An example of this relationship would be a talent agency in the US and a similar organization abroad working together to exchange artists and entertainers. To be eligible to enter the US through a government recognized reciprocal exchange program, you must have comparable skills to those US artists and entertainers traveling outside the US through the program. Evidence that an appropriate labor organization in the US was involved in negotiating, or has concurred with, the reciprocal exchange of US and foreign artists or entertainers. The written consultation by an appropriate labor organization is an advisory opinion on the artist’s or entertainer’s intended performance. Issues may arise if a position is covered under a union contract, in which case you may need a latter of no-objection signed by a local chapter official union representative. If you are planning to have performances in multiple areas, then an itinerary must be submitted that contains the dates and locations of the events. The initial period that you may stay in the US is the time needed to finish the performance, no more than 1 year. However, you may apply to extend your stay in 1-year increments in order to continue or finish the performance. It’s important to note that your family (the family of a P-2 visa holder) may obtain P-4 status and join you in the United States. This includes your spouse and unmarried children under the age of 21. While under a P-4 status, your spouse and children may not work, but may attend school or college. This allows families to stick together and continue their education while artists and entertainers are performing in the US. Additionally, some performances require support personnel to help with the performance. Essential support personnel who are an integral part of the performance of a P-2 artist or entertainer are eligible for P-2 classification themselves. However, the services performed by the support personnel need to be those which cannot be readily performed by a US worker. Support personnel may include trainers, stagehands, or those persons having critical knowledge of the specific services to be performed. There can be significant delays when applying for a P-2 visa. If you are considering taking part in a reciprocal exchange program and obtaining a P-2 visa, then please contact an immigration attorney and we can take you through the process.